This year we’ll see local SEO become even more important for marketers. Why? Local searches lead to more purchases than non-local searches. 18% of local searches on smartphone lead to purchase within a day vs. 7% of non-local searches. 30% of consumers would buy in-store instead of online knowing they are close to a store. I predict we’ll see signals of a transformation in the search engine landscape. Google may make the first bold move and begin to reduce the number of organic listings displayed in the mobile search results. (When was the last time you clicked an organic result from your phone?) They’ve already increased the size of their Adwords units by 58% in their new Expanded Text Ads. This takes up more screen real estate (especially on your phone) in the hopes of creating better-contained choices for the user. However, a major flaw exists in the early phase of the ad unit utilization: Only 30% of the companies in all industries have converted to ETAs. In fact, some early adopters are experiencing lower click-through rates because their ads are simply longer, but haven’t improved their contextual relevancy. Why do I believe this change will happen? The first clue was the elimination of the right side-bar ads earlier last year. Everyone was batching and blasting the same plain-vanilla ads that didn’t appeal to anyone’s search intent. Plus, we’ve experienced a massive change in how Google shows local listings due to the increase in mobile usage. Also, we observed a faster evolution of Facebook’s paid search advertising ecosystem than standard search engine platforms. Facebook quickly moved to a pay-for-play platform for advertisers and has quickly demonstrated how they can generate massive levels of revenue. About 80% of Facebook’s $7 billion revenue comes from mobile advertising. Facebook’s local data is an incredibly impressive and effective platform where shoppers can easily find what’s important to them – rather, the information finds them. Going even further, hands-free devices such as the Amazon Echo and Google Home will also change how we interact with search engines. These devices will also create more transactional based activities. As these activities continue, search engines will seek more alternatives to monetize their results. What Should I do? Hold Your Providers Accountable. Are your paid search campaigns fully converted to Expanded Text Ads? Make sure your ads aren’t just longer versions of your older ads. Increase your relevancy, not just your character counts. Is your website optimized for local prominence? Greg Gifford knows what’s up. Smart SEO is still a requirement. Consider companies who actually do the work needed, such as Search Engines MD. More dealerships will realize they’ve been measuring wrong metrics. The primary measurement theme for 2017 will be measuring the quality of traffic vs. the quantity of traffic. At the end of the day dealers only care about the marketing activities which demonstrate real results. Does It Sell Cars? Sure, historical analytics metrics such as bounce rate, page views and time on site are indicators of page and site quality. And yes, they contribute to the overall quality rating Google assigns to pages. These items on their own don’t indicate sales success. Bots became the new school SEO cheat because people realized how easy it was to correlate engagement with improved rankings. Unfortunately, this traffic is pure garbage and contributes nothing of value. Quality engagement drives conversion. We all understand video drives engagement rates that are up 10 times higher than standard content. It’s time this engagement is tracked properly to show ROI and give dealers the results they’re looking for from their marketing partners. Dark social will become a larger point of confusion. Apps, messenger apps, texting, and secure browsing (and others) make it impossible to track referral traffic. It’s happening at such a massive scale. In North America alone, dark social referrals account for up to 59% of referral traffic. Form Completion Rate (FCR) and Dynamic Phone Number Insertion activity reporting. The marketing ecosystem will be dominated by paid ad spend for content and eventually paying for video advertising solutions. Approximately 14% of marketers experimented with live video past year. I believe this may explode to over 40% of marketers using streaming media in 2017. Standard post reach has been pegged at approximately 1-2% while paid search spend has increased 234% in the past seven years. 2017 will see considerably less effort and resources spent towards irrelevant content creation. This is due to the fact the largest brands have cornered the content market and competing against them will prove to be worthless. This also ties into the understanding of the shopper’s journey and where they’re consuming different content. Visitors come to dealership sites to buy. Filling a website with irrelevant pages that don’t act as a catalyst to move the buyer to the buying stage is a waste of efforts. Dealers will realize their irrelevant marketing efforts are driving up costs and it can be prevented. Videos will create more empathetic and emotional experiences. I would also expect to see a better method of video channel organization on Facebook. (Think YouTube channels) I watched over 50 videos before I purchased my last vehicle. My youngest son began the search for his first vehicle on Youtube. Another indicator of this trend is the fact that Facebook changed its own experience to include a new section for its video feed within the app. The line between the standard newsfeed and the video feed will be blurred as the two experiences merge into one. Customers are four times more likely to take action on a product demonstration video. 75% of ALL Internet traffic in 2016 was streaming video. Facebook has also stated they will invest up to $4 billion dollars in more AR/VR experiences within the platform. Look for a new level of mobile video appreciation as Apple releases the iPhone 8 later this year, which is rumored to include mixed reality technology. This will usher in a new age of immersive experiences that raise the bar for incredible brand experiences. I believe (mixed) augmented reality will be more widely accepted than virtual reality due to the ease of use of out of the box and lower costs compared to VR solutions. Plus, AR is seen as less creepy and a lot less dorky. All of these improvements will keep users on their phones and contribute to changing how we find and interact with the products we purchase. Bonus prediction – Twitter gets bought out by either Google, Facebook or Salesforce. I expect to see more dealerships using Facebook messenger with some moving towards 24/7 coverage. I also expect to see larger brands leveraging message bots to handle initial conversations and customer interactions. Customer service will be defined by when it happens, not where it physically happens. More smart dealerships will leverage one-to-one communication platforms such as Slack, Conversations, or Pando for more personalized experiences. Our communication behaviors are changing as a result of the functionality available and the real-time experience it provides. Social and Messaging commerce will become more acceptable as users rely on this channel for customer service, FAQs, and appointment setting. Watch for more direct purchases via platforms such as Instagram and Pinterest. 31% of consumers are using social media platforms to actively search for products to buy. Their personalized and smart experiences make it easy and enjoyable. Younger users prefer Snapchat and I have a different theory why. Remember when many of us (I’m talking to the parents of Millenials or younger Internet users) could enjoy a social gathering without the fear of someone sharing content in real-time beyond your current location? Sure, photos and video cameras captured moments, but it didn’t have real-time broadcast capabilities and the ensuing consequences. Snapchat user behavior isn’t much different. They have the same experiences. They’re taking pictures and videos of each other without the risk of content going beyond the current situation. Sure, users can grab screenshots, but that’s not acceptable and tolerated. Just as it wasn’t acceptable for us to share content beyond its original intenders. As platforms, such a Snapchat and Instagram, continue to drive real-time disposable interactions, marketers will attempt to connect with these users. Unfortunately, about 74% of Snapchat users and 63% of Instagram users don’t even remember seeing advertisements on these platforms. As younger consumers maintain this type of activity, it will be become increasingly difficult to connect with these shoppers. Think of how many personal chat groups you currently have on your phone. Safe to say you have at least one text group, one in Facebook messenger and yet another in WhatsApp. I believe the real value for dealerships is real-time customer service via social messaging from multiple departments. Dealers shouldn’t be surprised to see more of their dealers adopting their own follow-up processes that include more direct video responses rather than standard email follow-up responses. Elise Kephart continues to do an excellent job of guiding dealerships and salespeople down the path of video personalization. Martech solutions will prove their value. Last year’s post also introduced the concept of dealers operating as Martech companies to improve their customer relationships. I believe those efforts will extend further creating more effective, relevant marketing solutions. Dealers will recognize easier, faster and more effective methods of creating and managing their website marketing processes. New vehicle sales may be flat in 2017 and used vehicles may be value plays for shoppers based on the inventory available. Mobile consumer behavior and many of the factors mentioned above will convolute the marketing processes. Third party platforms will find it increasingly difficult to provide dealers with concrete attribution and performance data. The dealership website must be the cornerstone of the marketing strategy, especially as dealers are offered more website provider alternatives. Watch for more creative designs, better mobile experiences and improved performance from website providers such as Carbase, DealerOn, and Dealer Inspire. Less than 5% percent of marketers receive the full benefit of the tools they’re using. 39% desire an improved technology strategy, 36% want to improve analytics reporting, and 33% want better support and training to help improve their current Martech tool performance. Nearly 88% of marketers use more than one Martech tool regularly, of which include single-vendor platforms. Only 16% of vendor suite users say it’s the only tool they use because of the ease of use, simplicity, and overall effectiveness. Incredibly, 42% of marketers described their marketing technology as “fragmented” or “piecemeal.” Sound familiar? Dealers want to change however, that change must be easy to understand and use. I’m also a used car dealer and we need to be as efficient and relevant as possible with our merchandising and marketing efforts. This will be an increasingly important philosophy for new and used car dealers in 2017. Our focus is simple: Make it as easy as possible for search engines to find our relevant organic and paid content – and deliver our content to in-market car shoppers faster. I’m putting my money where my mouth is and using the MPOP™ to manage our vehicle marketing efforts. Dara Moore: Customer retention is going to be the key to the dealer’s success this year. Tony Ly: Paid Traffic is and will continue to dramatically increase as Dealers, OEMs, Lead Generators, 3rd Party Buying services compete for clicks. We may see a point of saturation on some top keywords. Jeff Green: Speed, efficiency, creativity are all going to become exponentially more important in 2017. More specifically, aligning your marketing message to show customers that there’s more to your dealership than just the transaction. Standing out from the crowd gets harder every day as we all step up our collective games so creativity will make a huge difference. Customers will continue to demand a more streamlined road to the sale. End to end transactional websites will start to become even more common. F&I processes will get more streamlined allowing faster purchase experiences. Andrew DiFeo: I believe the shift from third-party advertising to the first party will continue, especially as more dealers harness the power of Facebook. Dealers must continue to make it easier for consumers to shop and transact online, as well as ensure their offline processes match their digital presence and brand promises. As Dara mentioned above, customer retention will yield the highest ROI versus trying to conquest customers from other brands and dealerships. More dealers will also realize not all web traffic is good web traffic. The amount of fraudulent web traffic, intentional or unintentional, to websites. is significantly higher than most people want to admit. Savvy Google analytics users can spot this, and now companies like Orbee can assist dealers in identifying this fraudulent traffic. Scott Monty: My wish: that a fraction of the budget allocated toward sales gets shifted to service, in an attempt to show existing customers that they’re more important, thus reducing the cost of new leads. The reality: the same budget will be put toward sales and no additional attention will be paid to service and retention, because of the increased efficiency of digital advertising. Eric Giroux: Page/site speed will become increasingly important. OEMs will continue to tighten mandates for their stores to ensure a consistent online and in-store UX for their consumers. More vendors and OEMs will push toward an online purchase/desking process. More manufacturers will explore a direct-to-consumer purchase process. Pricing will become more transparent as the market will demand it and more states will regulate it. And, of course, the race to catch up with Tesla will continue… more self-driving technology and (affordable) fully electric vehicles. Ed Brooks: My prediction, dealers will (finally) begin to move away from last click attribution and towards more advanced analytics. The age of influence measurement is upon us. Gary May: We can all hope. 80%+ won’t unless prompted by outside forces. Vendors themselves don’t get it. Most have never been into MCF in GA or even assisted conversions. Jarrett Kuljis: An increased awareness and concerns by Dealers about data ownership and access to that data. Obvious advancements in autonomy and traditional OEM’s embracing relationships with autonomous technology. Increased subscription to the on-demand transportation models, Uber, dynamic ownership… Maybe more automotive technology companies with dealer team in the domain name? Benjamin Freedman: Used cars will continue to become a commodity, the rise of digital merchandising (a best practice within digital marketing), innovations to help retain gross profit due to the commoditization of used vehicles, and digital marketing innovations across all stages of the customer journey. Robert Scoble: I’ll let you know. A major car company is taking me out in a prototype self-driving car on Wednesday at CES. My biggest prediction? Tesla won’t ship its model 3 in 2017. Kacie Faye: Say goodbye to the 3rd party lead generators and even a lot of SEM budgets will decrease as OEMs take over making it less affordable or efficient for dealers. Shift to creating home and work deliveries not only in sales but service too. Bring me what I want, when I want it I how I want it. Less about $$$ more about saving the customer time and giving them VIP service. Ryan Dunkle: 2017 for us will be about trimming the vendor fat. Taking the increased money over the past 1-2 years (that was supposed to get us increased sales) and reallocating it into new marketing and advertising areas. Deploying a new hybrid floor model to increase efficiency overall and create a better customer experience. Continuing our focus on retention both internally with employees, but also with our customer base. Lastly, continuing to learn and pioneer to be at the forefront of the automotive space for others to follow. Owen Moon: With 85% of all marketing currently being spent in the Consideration stage, Mobile GPS targeting will continue to become more of a factor as dealerships are now starting to understand the importance of reaching car buyers later in the shopping cycle. Lee Drake: Direct to consumer sales by companies like Tesla will significantly eat into dealer market share, just like it did in the IT world 20 years ago. Increasing political pressure on states that forbid direct sales like NYS from free market proponents backed by Trump will see more and more direct sales availability. When the mid price model 3 hits the street it’s runaway success will result in a huge impact on all non-Tesla brands, and major manufacturers will scramble (and fail) to create their own Giga factories. Tom Hawkins: “Direct to consumer sales by companies like Tesla will significantly eat into dealer market share”…this is NOT true…first of all, Tesla has no money except investor money. Secondly, this has been predicted for years…and we are still almost as far away as years ago. Troy Spring: I predict that the business will get harder for some and easier for others. Those that don’t already know the difference of why…. will be on the wrong end of 2017. Carl Bauer: Massive auction disruption by roaddealer.com. Patrick OBrien: In 2017 the car business will continue to allow indie dealers to dominate the used car sector. Chris Kelly: These are all very interesting! DISC! Here my prediction for 2017! Dealers will finally take charge of their marketing messages online and offline. Remembering cars are still an emotional purchase! The 2% of the grinding shopping public and 98% that can be brought into the cycle! This will be a year of waking up! Michael Warwick: As we approach a 70% turnover rate, dealers may finally realize that their managers actually need to know how to train their salespeople to be successful. Brad Hensley: “Traditional” dealerships that continue to try to crank “home runs” every deal will continue to shut the doors and wonder what happened. They tend to be ones who are force feeding warranties and not embracing a transparent process. Matt Watson: I’m hoping we see more and more electric cars! After owning one, I don’t understand why anyone would want anything else! I’m hoping the Chevy Bolt sells like hotcakes in 2017. Expense cutting challenges vendors. Showdown on DMS data. Used car supply is up, price pressure will be strong. Who knows, hoping the train keeps steaming along, just not sure it will. John Gentner: I predict a new up and coming dealership out of New York expanding even more. Adding 4 more stores blowing their sales and customer service through the roof….This prediction we have control of. Cliff Banks: AI becomes more prevalent; two big sales on the vendor front; at least two large dealer groups will be sold in 1st or 2nd quarter; 1st quarter pricing pressure on used vehicles; and a legal showdown on DMS data will happen. Larry Schlagheck: 1) Tesla wins a big lawsuit over franchise laws. 2) AI grows but infrastructure holds its growth back 3) Oil prices up. Truck sales down. Bill Playford: The battle of 2017 will be fought with inventory. Due to the market’s seemingly insatiable urge to purchase trucks, SUVs, and crossover-type vehicles, dealerships who are in urban areas or are limited on real estate, will be hamstrung by what they are able to stock. Manufacturers will be quick to use allocation as a means to control dealerships who do not care to fall in line with OEM mandates. Consumers will increasingly turn to virtual test drives (such as those on YouTube) and targeted social campaigns (follow the eyeballs) to hone down their selections. Dealerships that actively manage the proper selection, mix, and display of vehicles will be at a distinct advantage. In regards to tech, the onboard diagnostics port (OBD) will be the hottest piece of real estate inside the vehicle. Vehicle to vehicle (V2V) communication will gain steam along with the autonomous push so that older vehicles will function in the autonomous world. The same technology that will allow pull-alerts to be broadcasted will also be used to push alerts to vehicles and passengers. Services will be developed to proactively and automatically schedule service for vehicles, further bolstering the service department as a revenue generator. On the vendor front, a critical mass of dealers will leverage the NADA to finally crack the duopoly that is CDK and Reynolds & Reynolds. With falling margins, crippling fees, and questionable data practices, dealers will slowly, but surely, band together politically to get their way. Before things get busy in DC (and to counter Cox’s portfolio of services), CDK and Reynolds & Reynolds will go on an acquisition spree as a means to offer best-in-class tools to retain dealerships and protect their position in the market. Everyone will be happy…for a few months. Bold prediction: One OEM will have an autonomous shuttle offering service to and from the dealership by the end of 2017. Glenn Pasch: Education and then implementation. Too many people preaching without helping to implement. Learning how to spot the pretenders. 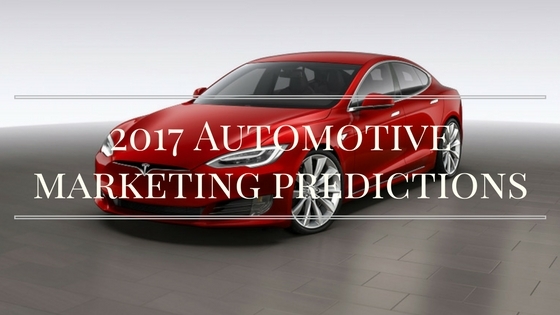 Ryan Everson: Some of my 2017 automotive digital marketing predictions…. Google Paid Search Ads Will Capture 50+% of SERP Clicks – With paid search ads looking more like an organic result and more relevant than ever before, the percentage of people who click on paid search ads will start to overtake organic clicks. Not participating in paid search will no longer be a viable option, dealers have to pay to play. Accelerated Mobile Pages (AMP) Will See Adoption in Automotive Industry – Automotive website providers will start implementing AMP versions of vehicle detail pages. Dealers need a great mobile website in 2017 not for Google but for our customers and faster pages will help drive conversions. Display Ads Evolve into Native Advertising – Customers continue to largely ignore display advertising regardless of how well the targeting may be. Native advertising will grow in popularity as an effective way to get customers’ attention more naturally. Dealers Will Start Targeting Niche Markets – Almost every dealer is active online nowadays which has resulted in crowded and more expensive online marketing while the number of consumers has remained more or less steady. Astute dealers will start targeting more specific niches and queries which will result in almost personal level content and ad campaigns. Online Retailing Will Finally Gain Real Momentum – After failures like GM’s shop click drive, this is the year that online retailing will finally start to pick up steam. With tools like Joe Chura’s Online Shopper, dealers will finally be able to offer customers the online buying experience they have come to expect and are increasingly desiring. 2018 PWA Prediction – Innovative website companies will start developing a progressive web app version of their websites in 2017 that will be ready to launch in 2018. Customers love the experience of mobile apps but getting them to install one is near impossible for dealers whereas progressive web apps will provide the mobile app experience while still being indexed by Google and not requiring the user to download anything. Bill Simmons: I believe 2017 will be the year that many smart dealers prepare for the expected industry slowdown in 2018. Many single point dealers may realize this could be the last year of record blue sky numbers and sell out to a mega group in their area. I’ll go against the idea that dealers will increase digital paid search spend. But will reallocate their dollars from some of the digital fluff like retargeted display ads that many studies prove are not effective at all. Look for those dollars to be shifted to tried and true paid search methods including Facebook. James Klaus: Website companies will see their dealers shopping for a better customer experience on mobile. We have known the importance of mobile for years, hopefully, this will be the year that mobile is no longer ignored. Chuck Parker: Media is generally ineffectual in not only advancing automotive business model strategies — but in gaining any respect for ideas or visionary thinking, however subliminal — so the current dealer business model is in for massive migrations and changes in next 3 to 5. Dealers should become Total Transportation Management Centers and the Beepi/Fair business model should move to a Personal Vehicle Management Strategy. Stand by for more. Thank you for reading and thank you to everyone who contributed their vision for 2017. I look forward to seeing many of you at NADA in New Orleans. Keep learning. Keep helping others. And keep on improving the retail automotive industry.